Difficult letter saturated with pain, written in a depressed tone, composed by Gordon while he was suffering from various ailments. In his letter, he details his harsh illnesses and great suffering in somewhat lyrical prose. 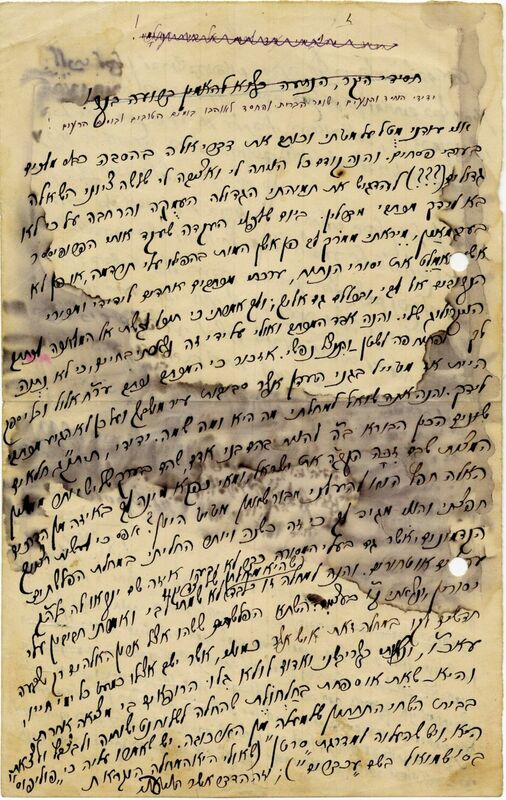 It is not clear to whom the letter was addressed, it turns to the addressee with the description "My dear Chassid, will we stray and not believe in the coming salvation!" "You ask about my illness, what it is, what it's called. My friend, the Blessed Creator prepared 953 different illnesses with which he causes people to die, which is approximately 1/3 more than the number of mitzvot with which the Holy One, Blessed Be He brings merit to Israel, and what difference does it make to you which of these ways it is ... It's been a year and more since I became ill with the disease of the ancient Philistines, and even the transmitters of tradition no longer know its name in the holy tongue - עכברים or טחורים, and this disease alone, which is a disease of the righteous, I paid no attention, and I said to myself that suffering is beloved to me [חביבין עלי יסורין]. Now the Philistines who stayed by the holy ark of G-d only seven months were stricken with this disease, as for a man like me who has sat by it almost his entire life ... there are those who call it פוליפוס (in the book of Shmuel, 'עכברים'), and there are those who have elevated it to the level of cancer ..." Gordon later writes about his stay in a Berlin hospital for various treatments for his illness. At the end of his letter, Gordon writes his opinion about writing poetry at that time: "I said that in these precipitous times, Israel does not desire poetry, melodies and flower gardens, and those who write and publish them see no blessing in their handiwork ..."
Yehudah Leib Gordon [1830-1892] was one of the leading Hebrew poets of the enlightenment. His creations included original and translated poems, fables, feuilletons, stories, and scholarly and critical articles. He was born in Vilna in 1830 and studied in "cheder" in his youth, where he acquired extensive proficiency in Talmud and Tanach. In his adolescence, he drew close to the haskalah movement and began to read books of general interest, study foreign languages and to strike up friendships with some of the leading maskilim of his period, who influenced him very much. He worked as a teacher in schools in Ponovezh, Šilalė and Telz for 20 years. As a famous poet, he was invited to St. Petersburg in 1872 to serve as community secretary and administrator of Mefitzei Haskalah B'Yisrael. He wrote a lot in the HaMelitz journal and was one of the editors of HaMaggid. He passed away in St. Petersburg in 1892. The letter's conclusion may be lacking. paper leaf written on both sides. There is an X-shaped scrawl on the back of the letter, with no damage to text. 13x21 cm. Large stain from an ink-smudge. Filing perforations. Fine condition.